Veteran New York Times journalist Michael Moss entered the world of food reporting when he covered a salmonella outbreak in a Georgia peanut factory, a story he came to see as being about “loss of control by the food industry.” He followed up on that theme with an investigation of E. coli-tainted Cargill hamburger, which earned him a Pulitzer Prize in 2010. Around that time, he says, a close source told him, “As bad as these contamination incidents are, there’s this other public-health crisis out there that’s caused by the stuff we intentionally put it into processed foods, and have absolute control over.” Meaning, of course, salt, sugar, and fat – the “holy trinity” of processed-food ingredients, and the namesake of Moss’ new book. 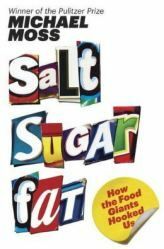 Salt Sugar Fat: How the Food Giants Hooked Us traces how these ingredients worked their way into our food in ever-larger amounts, not by accident but as part of a concerted effort by food companies to make their products as irresistible and addictive as possible. Moss profiles the food scientists whom corporations like Kellogg and Kraft pay to formulate exact combinations of ingredients that target consumers’ “bliss point”: where food is as tasty as possible without being so satisfying that we stop wanting more. Think junk food like Cheez-Its, movie-theater popcorn, and Oreos: You can kill a whole bag of the stuff without even noticing. Moss reveals how fundamental these ingredients have become to the processed-food industry’s entire model: how sugar intensifies our cravings; how fat and sugar work together to make products vastly more tasty than either ingredient could alone; how fat plays up a given food’s most desirable traits (such as smooth texture) while masking others (like the acidity of sour cream), and how salt smothers the chemical tinge that would otherwise make most junk food inedible. Salt, sugar, and fat also make possible the long shelf life and easy preparation that inspired the term “convenience food” and sold it to a new generation of working moms. Q. Salt Sugar Fat reveals parallels between the food industry and tobacco industry’s efforts to get us hooked on their products – not just through creative marketing, but by focusing on the way our bodies react to key ingredients. Does this mean we could legally go after food companies in the same way? A. The processed-food industry is entirely confident it can withstand tobacco-type litigation. I think their confidence comes from the difference between tobacco and food, inherently, and the difficulty that a lawyer would have blaming any one company or any one product for the obesity crisis or diabetes. That said, there’s certainly nothing stopping the states from going after processed food collectively, because the estimates are that obesity is causing as much as $300 billion in extra medical expenses and lost productivity every year. So it’s probably a [bigger] issue financially for the health system than even tobacco. What really struck me in reporting the book was how the tobacco industry plays another role. Philip Morris, the largest tobacco company, became the largest food manufacturer in North America, by buying first General Foods and then Kraft. Starting in the late ’90s, Philip Morris kind of gets religion on tobacco – it’s under increasing regulatory pressure, it starts worrying that it’s losing the public trust, it’s constantly polling consumers, and its reputation is plummeting. It becomes the first tobacco company to embrace government regulation as a way of avoiding complete disaster. So they turn to their food division, and said to them, you guys are going to face as great, if not a greater, problem with salt, sugar, and fat as we are with nicotine and tobacco. You’ve got to start doing something to reexamine your dependence on [those ingredients]. I found it really startling that tobacco would be the entity warning the food companies about obesity. Q. In the book, you emphasize how hooked the food companies themselves are on salt, sugar, and fat. How much of a barrier is that dependence to efforts to change the industry from within? A. The industry makes a convincing argument that it never wanted to make us obese or otherwise ill. The problem lies in their collective zeal to do what companies do, which is make as much money as possible by selling as much product as possible, and on their dependence on these three ingredients to make their products ultra-convenient, ultra-low-cost, as well as utterly, irresistibly tasty. These three ingredients to them are miracle ingredients. Sugar, for example, will allow long shelf time, and will also add bulk and color to cookies and donuts and breads. Salt is perhaps the most magical of all three. It’s really cheap – 10 cents a pound – and it allows them to avoid using more costly ingredients like fresh herbs and spices. And salt masks some of these awful tastes that are inherent to processed foods. Meat, for example: They have to cook it once, and then they’ll put it in the box or the can, and when you reheat it, it emits what’s called warm-over flavor. Food scientists describe the taste as being like wet dog hair, maybe a little cardboard, too. Salt acts as a masking agent for all that. Q. That begs the question, then, whether these companies can make their food healthier without changing their entire product lines and business model. What does that say about how much power we as consumers have? A. Certainly in my life, I’m not seeing an ability to get away from processed foods. My wife works outside the home and I have two young boys. Our strategy is more to gain control over these foods rather than avoid them. My wife recently said, “Look, guys, let’s try to limit ourselves to cereal that has five grams or less sugar per serving.” When you engage them that way, now when we go shopping, it’s a bit of an Easter egg hunt for them. They’ll grab the box and look on the label and look for five grams or less. They’ll have to reach low on the shelf, or I’ll have to reach high, because strategically, the less sugary cereals are put out of eyesight. The industry’s done research – they put devices on people’s heads to measure their eye movements – and they know that when you hit the aisle, your eyes go right to the middle part of the aisle, at eye level. So if you’re looking for plain oatmeal, it’s likely going to be either way up or down, toward the ends of the aisles, where you’re less apt to see it. Q. Couldn’t they just put all the healthy food in the middle of the aisle, then? Do unprocessed foods just need better advertising? A. Another problem in the grocery store is the processed foods are so much cheaper than the fruits and vegetables. 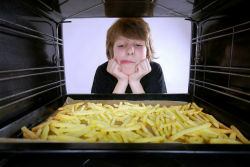 The White House is looking at not necessarily taxing the processed food or its main ingredients, but shifting subsidies that already exist that benefit processed foods over to the fruits and vegetables – as a way of avoiding the nanny-state label that Mayor Bloomberg of New York doesn’t mind getting hit with. [Former Philip Morris CEO Geoffrey Bible said to me], I’m no friend of government regulation, but what you’re seeing with the food industry is that anytime one of these companies tries to do the right thing individually, the competitors swoop in. He said in this case, it’s pretty clear that unless the industry can get together – which I don’t think is going to happen – regulation may make sense, if only to give them cover from Wall Street. That’s one of the huge forces here. When you’re inside these companies, they’re not evil, they’re just doing their jobs as best as they possibly can. Q. What has industry reaction to the book been like? A. It’s been pretty quiet. I’d like to think it’s because the reporting is fair and balanced and it’s already incorporated all of [the food companies’] main arguments. The notion that they themselves are dependent on [salt, sugar, and fat], they saw as a defense, but in fact it sort of turns on them when you put it into the right context. Knock on wood. They may be sitting right now and plotting. This entry was posted in Health and tagged blood glucose levels, carbs, chronic health conditions, diet, Farmington Hills chiropractor, fast foods by tiptonchiro. Bookmark the permalink.